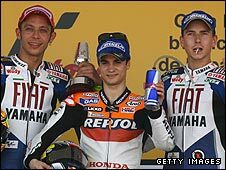 The second round of the championship in Spain was built up by the host nation as a battle between Dani Pedrosa and Jorge Lorenzo. Dani has never made much of a secret of his dislike for Jorge, who seems to revel in the antipathy, appearing to make it his business to wind him up, like an annoying little brother. After getting blanked twice by Dani it is said that Jorge approached him on Saturday and asked why he refused to shake his hand. "Why would I want to?" was the reply, sparking handbags at twelve (mini) paces and extra spice ahead of Sunday's race. 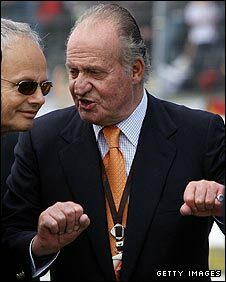 Amongst the 140,000 crowd that turned up to watch the fireworks between the pair on the track was the King of Spain himself, Juan Carlos. After Pedrosa scorched to victory and Lorenzo finished third, the King took both of them by the hand on the podium and clasped them together in a reluctant first handshake that made Sunday night television news and dominated the front page in Monday's national daily ABC. Elsewhere, the prospect of odd-shaped balls got myself and Suzi Perry excited on Friday, when we were invited to the Repsol Honda 'media scrum'. Unbelievably, this was how their official invitation to a press debrief with Dani Pedrosa and Nicky Hayden was worded on a team press release. Imagine our disappointment when we turned up in our shorts and rugby shirts, gumshields in place and our ears taped down, only to find a bunch of old hacks sat around a table fiddling with their dictaphones! Finally, I'd like to spare a thought for 125cc rider Randy Krummenacher, who didn't even make it to the track for first practice on Friday after complaining of severe stomach pains. It turned out that a mountain bike crash on Easter Monday had caused internal bleeding and he was rushed to hospital, where he underwent an operation to remove his spleen. An air ambulance was due to take the 18-year-old back to Switzerland on Monday but after losing 3.25 litres of blood and reportedly coming within an hour of his life he will need an extensive recovery period. Let's hope he gets back to full health swiftly.